Today, a global movement to invest in women and girls — to support and enable them to create change and pursue their dreams — has begun. At a recent gathering, a group of global leaders identified this as “the decisive decade” for the Global Women’s Movement — a critical time to put our efforts into “high gear.” At stake is the very future of our world. For as the data clearly shows, it is only through accessing the untapped resources of women’s energy, creativity, and economic might that our societies will solve the crises we now face. 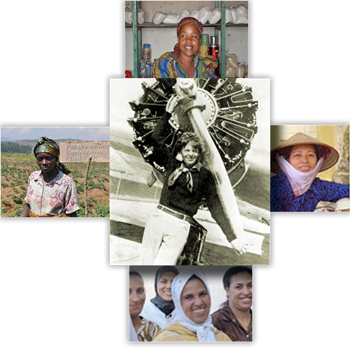 The mission of the WHW Global Courage Award is to honor women whose bold actions serve to focus energy and attention in such unique and powerful ways that they accelerate the ongoing change — change that is vital to creating a more prosperous and peaceful future for us all. Electra Sold to Seattle Museum of Flight! WHW has announced that they sold the Lockheed Electra at the beginning to 2013 to one of the top Museums of Flight in the country.